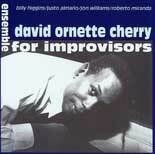 Ensemble for Improvisors is the brainchild of David Ornette Cherry featuring the unique creative collaboration of extraordinary, distictive musical personalities of David, the composer himself, on acoustic piano; Billy Higgins, drums; Justo Almario, reeds; Roberto Miranda, acoustic bas; and Jon Williams, trumpet. Movement One, Instantaneous Text is Colemanesque in flavor, both earthbound and galactic in flight, and a percusive, hypersensitive and ferocious masterpiece. Movement Two, We Remember When, is absorbing, both worldly and magical, and universally nostalgic. Movement Three, Start Off Fresh, is an intricate free-falling groove. This tour de force was inspired by the elaborate, rich compositions of Davidâ€™s father, Don Cherry, found on his recordings â€œComplete Communionâ€� (1965-Blue Note 22673) and â€œSymphony for Improvisersâ€� (1966-Blue Note CDP7620). David was still in elementary school when bombarded by the sounds of these two recordings. He had no clue as to what he wanted to be â€œwhen he grew up.â€� But, no doubt the concept was indelibly etched into his psyche. VoilÃ¡! Here is the result. This exquisite lesson in spatial, thematic composition is infiltrated by spontaneity of expression on contrapuntal themes. To hear this recording validates the lasting qualities of free-flowing musical dialogue. Donâ€™t take my word, listen and be pleasingly spellbound.